Stunning, luxurious villa in the surroundings of La Roche-en-Ardenne. 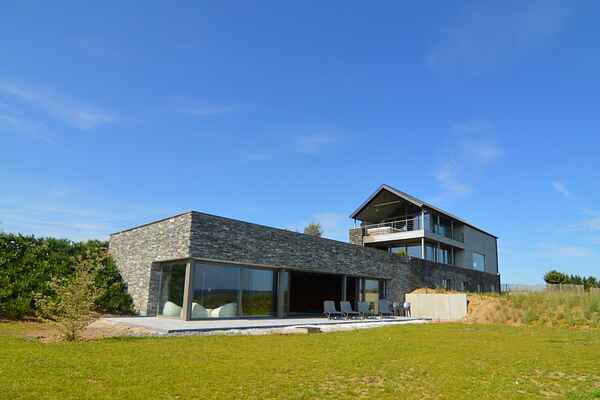 Due to its fantastic location on a 400 meter high hill, you can enjoy an amazing 360 ° view over the hilly landscape. Great for families. The living room is spacious and features a large seating area with very nice fireplace. You will also find the dining area with dining table for up to 16 people. Next to that is the luxurious, fully equipped kitchen. The bedrooms are generously sized and all have private bathrooms. On the mezzanine you'll find a football table. If you want to really relax, then of course you'll go to the relaxation area with large sauna and swimming pool. The area is nice and quiet and you have a large garden with a patio, barbecue and Jacuzzi. Around the house there are several hiking and biking trails. There are plenty of other activities and attractions, including a walk to the Nisramont dam where you can go kayaking on the Ourthe river. Also worth a visit is La Roche-en-Ardenne, with its feudal castle and many shops. For winter sports lovers we recommend Samrée and Baraque de Fraiture.